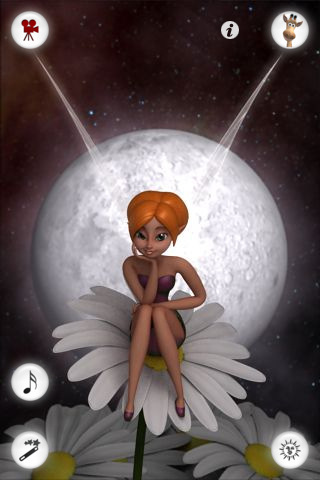 Talking Lila the Fairy - Lila is a fairy the size of a flower and she lives in the meadow. Lila loves to sing and cast magic spells. She can manifest flowers, animals, stars and other items with the help of her fairy dust. Sometimes though her spells misfire and Lila must sort the mess. Discover Lila's magical world of songs and spells. Talk to her and she will repeat, poke or tickle her, make her sing or cast magic spells. · Talk to Lila and she will repeat. · Switch between daytime and nighttime. · Poke Lila to see her make faces. · Tickle Lila to make her giggle. · Swipe Lila to make her spin. · Press the magic wand button to see Lila cast magic spells (4 daytime spells & 4 nighttime spells). · Press the song button to hear Lila sing (2 daytime songs & 2 nighttime songs). iPod Touch 1st, 2nd & 3rd generation owners: Your earphones must have a microphone otherwise Lila won't be able to hear you! Join Tom, Lea and their friends in their amazing adventures on your kid's desk!